Download or update Conexant HD Smartaudio drivers for HP, Lenovo, ASUS, Dell, Toshiba or any other computer brand on Windows 7/8/10 32bit or 64bit. You can pick out a way which suits you from the following methods. When your Conexant is not working in Windows 10, the first thing you may think about is to update the Conexant audio driver in device manager. 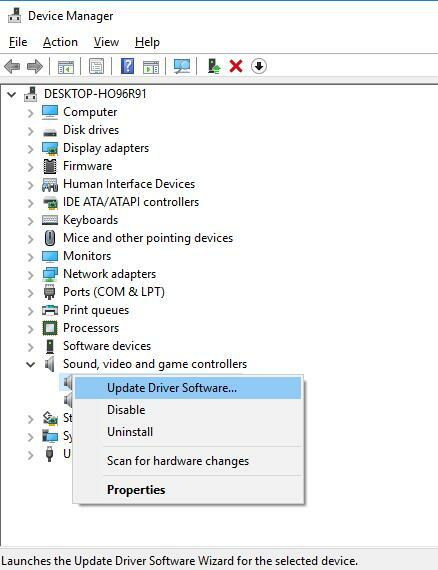 1: Navigate to Device Manager > Sound, video, game Controllers > Conexant Smartaudio driver > Update Driver Software. 2: Click Search automatically for updated driver software. Then Windows 10 will search for the Conexant HD audio software online for you. 3: Windows 10 will install the best-matched and latest Conexant HD Smartaudio driver for you. After that, you can play an audio or video on your computer and you will find it has the high-quality sound with the Lenovo, ASUS, HP latest Conexant audio drivers. You can choose to download or update Conexant audio drivers on your own. But even though Conexant creates a great many of audio and voice-enabled products for computer peripheral and sound systems, such as Conexant HD Smartaudio, the Conexant website does not provide any Conexant audio driver for users, so you have to go straight to the manufacturer’s official site of your PC. As it is known that there are several principal computer brands in the world, so you can go to the respective official site to download the Conexant HD audio drivers depending on what kind of brand computer yours is. 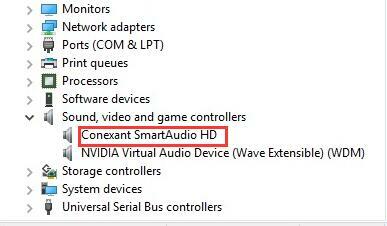 For example, if you are Lenovo users, you can enter Lenovo site to search Conexant Smartaudio driver for Lenovo. Similarly, you can as well get the Conexant Smartaudio drivers for ASUS, HP, Toshiba, Dell on its own site. In addition to the ways above, you can turn to an automatic method to download Conexant HD Smartaudio drivers. It only takes you several minutes to finish the downloading process. 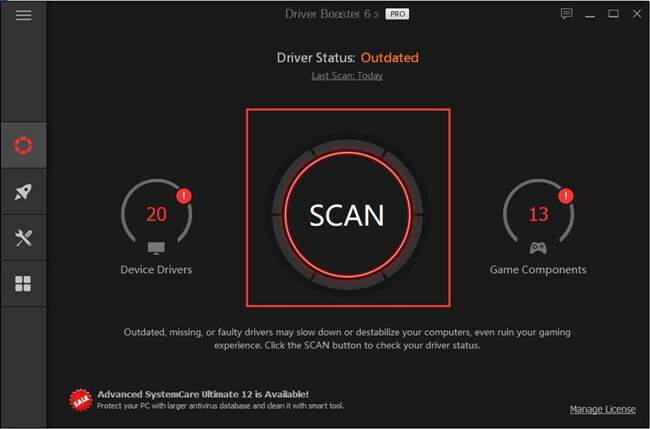 The automatic way means you can make full use of Driver Booster, which is a totally safe and professional instrument for you to download all the missing, outdated, corrupted drivers for your computer. Besides the drivers, it can also helps to update the game components to help fix the game error. At the beginning, download Driver Booster, install and run on your computer. 1. Click Scan button. 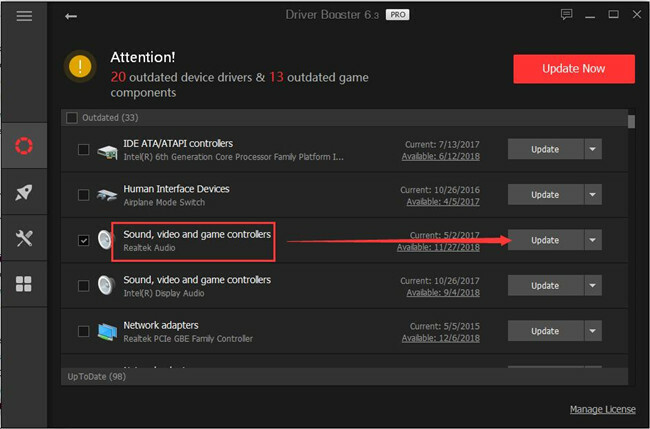 Driver Booster will search for the drivers to be updated, which includes Conexant HD audio drivers. 2. Click Update. Find the Audio driver and click Update. In the downloading course, Driver booster will scan, get and download the drivers without your own operation, all you need to do is to click the two buttons. You can clearly see that Driver Booster will get all the drivers for you within three clicks and the process will only last only several minutes. So it is wise of you to learn to use Driver Booster to download or update Conexant Smartaudio drivers for your Lenovo, ASUS, HP, etc.